The Philadelphia Union cruised to a comprehensive 3-0 victory over the Columbus Crew last Wednesday, a win that pushed them into third place in the Eastern Conference. All three Union goals came in quick succession in the first half, beginning in the 25th minute when a shot from Brian Carroll deflected off Eric Gehrig and into Andy Gruenebaum’s net. Four minutes later, Carroll flicked a corner from Sebastien Le Toux to the back post, and Sheanon Williams volleyed home from close range. Finally, in the 31st minute, Le Toux played a cross to Conor Casey, whose diving header put the Union firmly in control of the game. The Crew struggled to create chances all night, while Philadelphia often looked likely to extend their lead even further. It’s disappointing for Columbus, who now sit seventh in the Eastern Conference, but it’s another step forward for the Union. Two late goals from Olmes Garcia grabbed the 3-1 win for Real Salt Lake at Rio Tinto, capping a night of high pressure soccer that stayed locked at 1-1 until the 84th minute. The two teams swapped goals just before halftime, first with RSL’s Khari Stephenson striking in the 44th minute from outside the box. But then, in first half stoppage time, Landon Donovan blasted a shot in from just inside the 18 after the ball pinged off of Nat Borchers’ head and fell perfectly for the Galaxy captain. Garcia entered the match in the 58th minute, and with just six minutes left to play headed in a ball from Javier Morales to give his side the lead. To top things off, in second half stoppage time Garcia collected a pass on an RSL breakaway and slipped his shot through keeper Brian Rowe’s legs. 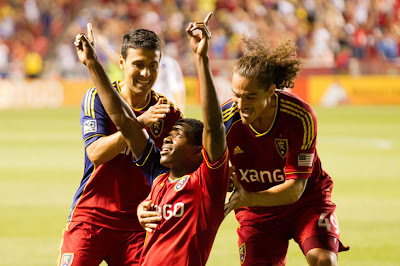 RSL move into second place in the Western Conference, while the Galaxy occupy fifth. The Seattle Sounders and Vancouver Whitecaps made sure their Cascadia match up was an entertaining one, with each side scoring goals in a wide open night of soccer. Andy Rose got the home side on the scoreboard in the 9th minute, accepting a weighted ball from Lamar Neagle and striking a right-footed shot back post. The ‘Caps returned the favor almost immediately, however, as just a minute later Camilo Sanvezzo headed in a Russell Teibert cross. Then, in the 26th minute, Teibert sent in a free kick that first found Camilo’s head and then found the back of the net, and suddenly Vancouver were leading 2-1. 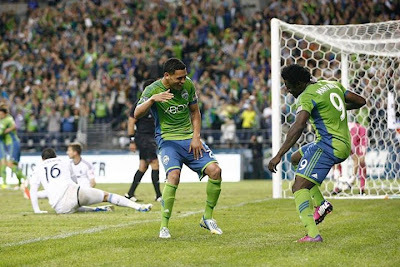 The second half continued the game’s intensity, and the Sounders leveled things again through a Servando Carrasco penalty in the 70th minute after Lamar Neagle was taken down by Greg Klazura. Finally, with ten minutes to go, Lamar Neagle scored at the near post off a low cross from Obafemi Martins, and Seattle got the home win over their rivals. To some surprise, the San Jose Earthquakes have parted ways with head coach Frank Yallop, who was named Coach of the Year last season. Mark Watson has taken over as interim coach. Elsewhere in MLS this weekend, Mike Magee scored his second goal in two MLS games for the Chicago Fire, who battled to a 2-2 come from behind draw against the Portland Timbers. 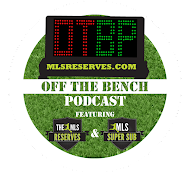 The only other game this time around was a 0-0 tie between the New England Revolution and DC United; the result was disappointing for a Revs team on the upswing, but a cautious positive for a DC team in need of any points it can get. Finally, don’t miss Open Cup action on Wednesday when a number of MLS teams will be playing to advance to the next round. On Saturday, the Portland Timbers host FC Dallas, while Toronto visit DC United and the Montreal Impact head to Columbus. Then, the San Jose Earthquakes travel to Colorado, and the New England Revolution hit the road to take on the Vancouver Whitecaps. Four more games are on Week 16 slate for the following Wednesday, with the Houston Dynamo visiting Montreal and the Colorado Rapids traveling to Chicago. Finally, the ‘Caps face Chivas USA at BC Place, and the LA Galaxy welcome the Portland Timbers to town. Olmes Garcia. A brace off the bench is impressive on its own, and even more so when it’s against a team like the LA Galaxy. Garcia, by the way, is just 20 years old.